What follows is a quick guide to how self-help housing works. 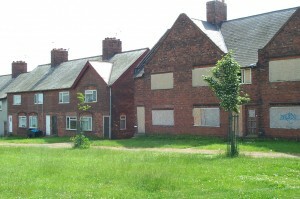 Properties owned by a local authority or housing association that are awaiting improvement or redevelopment. Properties in private ownership that are standing empty. You may be able to identify a property or properties for yourself, or you may want to approach one of the owners above and ask them what might be available. How long might they be available and will the owner charge rent? The “life” of the property will depend on what is ultimately going to happen to it, but it could be anything from a matter or months to five, ten or even fifteen years. It’s likely not to be practical to take on anything with too short a life (perhaps less than a year) and it may be that’s it’s offered initially for a certain period, which can be extended as time goes by. what condition they are in. either way, the rent needs to be small enough to make it economically viable to take them over and carry out any repairs that need doing. To persuade the owner to let you take on the property, you’ll most probably have to set up some sort of project, since they usually won’t hand over properties to an individual or even several individuals. They’ usually prefer to enter into an agreement with an “organisation” of some sort, which has clear aims and objectives ( eg to house and support certain sorts of people). your willingness to hand back the property at the end of the agreement. What about funding for any necessary repairs? How much money will be needed to bring a property back into use will obviously depend on its state of the property and for how long it’s available. Many projects finance repairs by simply “recycling” the money that will be received from renting them out over the life of the property, and using it to pay for whatever works are necessary. However, depending on the circumstances it may be possible to get a grant from a local authority or via a housing association to carry out the works. It may also be possible to get grants from local charities to cover some or all of the costs. How can repairs be organised? Depending on the extent of any repairs that need to be carried out and the amount of money available, it possible to either use builders, do the work yourselves or to opt for some sort of combination of the two. To get to get the electrics, gas and roofing done a builder will usually be necessary, but there are lots of repairs that can be undertaken by prospective occupants, subject to the necessary health & safety considerations. Once you’ve negotiated the use of the properties, then the decision will largely be yours, subject to any conditions that the landlord may specify. .
By and large, those interested in self- help housing are people, who for one reason or another, are not going to be offered a permanent tenancy with a local authority or housing association. These are likely to be single people who are not deemed to be “vulnerable”, couples, people leaving institutions of one kind or another, refugees etc. Because of the short term nature of the accommodation, it usually best to avoid housing people who are in some way vulnerable or have dependents which mean they that need long term accommodation. To help people who are already involved in self- help housing share their experience and help one another.